Fresh back from my recent trip to Gran Canaria I had to do a quick turnaround to be ready for a whirlwind trip to SnowWorld in Holland with SkiBike Blog contributor Andy C. He is an accomplished trail rider, who also recently experienced riding both skibobs in Austria and freestyle skibikes in America. 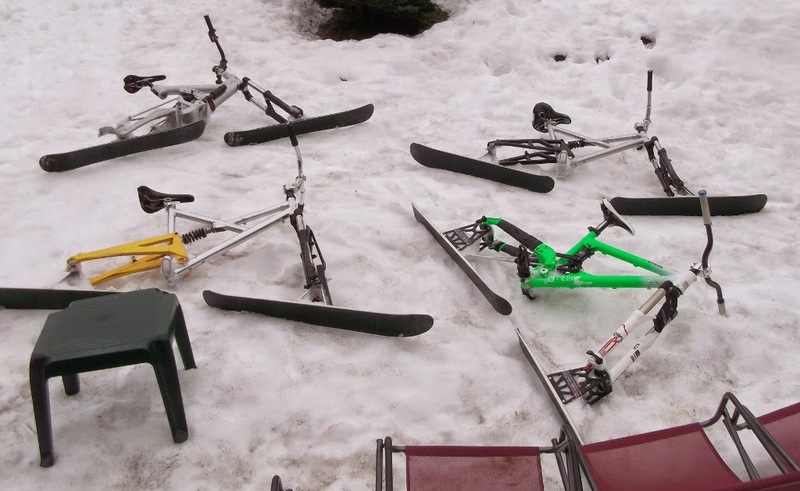 He plans to assemble his own skibike conversion in the near future and wanted to see how they ride without waiting for the season to start. Journeys feel a lot quicker with two people in the car, especially someone with Andy's encyclopaedic knowledge of mechanical matters to share. For once the journey ran like clockwork leaving us with plenty of time for beers and unsurprisingly for Holland, one of the cheesiest of four cheese pizzas I have ever eaten. My last visit here was in the height of summer and at the time just the one (easy) slope was open, but this time slopes on both sides of the chairlift were in use. Given that both runs are served by the same chairlift it seems that the laws of physics have been broken to create a noticeably steeper slope to one side. At its extremity a slalom course had been roped off, being enthusiastically exploited by a youth ski team who had, somewhat ironically, travelled 8 hours from Zermatt in Switzerland to take advantage of the perfect conditions to be found here at SnowWorld in Holland. Andy rapidly dialled in to the feel of my spare skibike and we passed our time playing around with different styles of riding, starting with the English turn and working up through a selection of riding styles. Before we knew it it was late afternoon and we ended the day grabbing some action pictures and video clips, before making the run back to Calais. All in the trip cost about £130 per person, which is not bad considering the amount of time you get can spend on the snow. And if you want to know how to do an English turn you'll just have to get yourself on the list for the next visit to SnowWorld in Holland. The answer was pretty much yes to all of the above; after the 2014-15 SkiBike Tour finished in April I had to dive head long straight into boring old work and yes working triply hard would be a fair estimation. I also had a number of essential house repair projects to push through during the summer, refurbishing and redecorating the exterior of both mine and a neighbour’s houses; even so I somehow managed to squeeze in an indoor skibike trip to both SkiHalle and SnowWorld in early July. Unfortunately, with all this manic activity I picked up a horrid cough that lasted from mid-August through till early October, as a result of all this furious endeavour I was getting a bit burned out and desperately needed a quick break to re-vitalise. So feeling like an old man I stepped aboard an EasyJet flight for a trip to the island of Gran Canaria for a week or so of rest and relaxation. Despite these worthy intentions, if I could squeeze in a mountain bike related adventure, well so much the better. 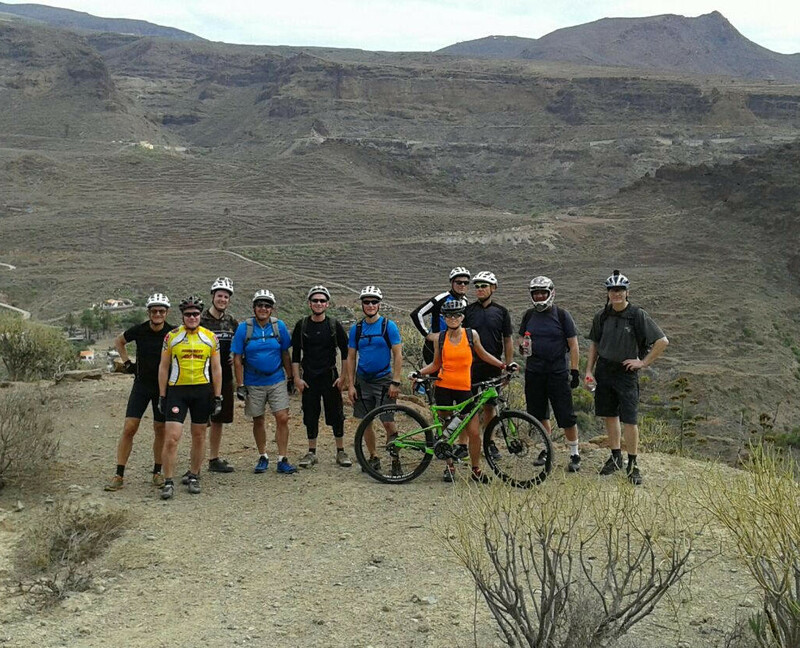 I should mention that I have visited the island of Gran Canaria many times in the past; around the year 2000 I even packed a very heavy and primitive DiamondBack rigid mountain bike into a bag and gave it my best to conquer the many peaks to be found in the centre of this island. This time round I was looking for some uplift that would evade the whole tedious business of spending 6 hours of climbing for just 30 minutes of wild descent. My research took me to Free Motion a trendy looking outfit that offered mountain bike tours, with uplift, bikes, water and even a sandwich included on their jaunts. I made some last minute arrangements through their website to join the "La Fortaleza" tour which promised 1350 metres of vertical descent for a mere 440 metres of ascent. You never know what lurks behind a shiny website, I had suspected that the Free Motion base camp in Playa del Inglés would be just three enthusiastic guys with a mini bus and trailer. To my surprise I discovered a large scale operation with more than a whiff of Teutonic efficiency about it. Apart from the formidable showroom and shop, there were the outdoor workshops and racking systems, all complemented by a shiny collection of branded vehicles filling the parking lot. It was precisely the sort of operation that would not have looked out of place in the centre of Gstaad and a quantum leap from usual Spanish resort bike hire operators. Having checked in, I had a few minutes spare to grab a coffee and pastry from the German bakery on the other side of the road before getting on the shuttle bus for the 900 metre vertical uplift close to the village of San Bartolomé de Tirajana at the start of the tour. On the bus there were the typical mix of super fit Germans, Swiss and sundry Scandinavians present, plus Team GB comprising myself and Magnus, who had made the long journey down from The Orkney Islands to represent Scotland. 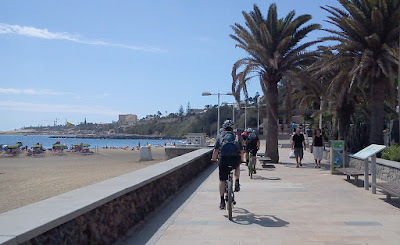 The journey up to San Bartolomé de Tirajana only takes 20 minutes from Playa del Inglés, once at the top we were assigned our bikes and had the chance for a quick pedal around the car park to familiarise ourselves with our steeds. Mine was to be a Cannondale Rush 29 2, a marque I haven't previously encountered, my first impressions were of a sturdy, yet light mountain bike with plenty enough travel to soak up the bumps. It was the first 29er big wheeled mountain bike that I've had a chance to ride and it seemed very efficient, requiring very little energy to get going and minimal rolling resistance, in spite of the monster tyres fitted. It was also my first experience of using disk brakes too, which proved to be very suitable for the task; although the brake levers were the wrong way round compared to UK practice, with front on the left and rear on the right. I was going to have to be especially careful not to accidentally grab the left one on descents and risk heading over the handlebars. Somewhere along the immense Barranco de Tirajana - spot the skibiker! The ride began rather abruptly with an "easy" warm up, climbing up a lung bursting 20% gradient, above the village, I was relived to see the odd person get off and push and gladly followed suit. The pain and effort were soon forgotten as we plunged down vertiginous descents through the village of San Bartolomé de Tirajana, the tyres scrabbling to maintain traction with the concrete, rubble, rocks and dirt that formed the path running between the houses. I was focusing on avoiding the near lethal consequences of grabbing the front brake and had to keep repeating to myself "right hand only, right hand only, right hand only" like a mantra. Heading South towards the sea, we worked away along long sweeping dirt trails following the West side of the immense Barranco de Tirajana. In some ways this was the most enjoyable part of the ride as you could go pretty much flat out and let the bike's suspension take the strain. Although the Cannondale Rush 29 2 is one of Free Motion's most basic hire items, I found that it had lots of control for locking out the suspension on climbs or road sections. Bike Radar gave the Cannondale Rush 29 2 quite a poor review seeing the Fox fork as a weak point; fortunately I hadn't read the article before the trip, furthermore given the vintage nature of the bikes I typically ride, I found it to be a superbly well engineered machine. We stopped half way along for a lunch stop and I got the chance to deplete my ample water reserves. I had been concerned about de-hydration so brought with me 2.5 litres of water, only to find myself handed another 2 litre bottles by the Free Motion guide to stash in my back pack at the start of the ride. I was greatly relieved to loose a good couple of Kilos of weight of my back at this point. On the next leg of the journey we emerged from the clouds and into the desert heat of the South coast of Gran Canaria with water streaming from my downhill style helmet on the more exerting climbs back towards Playa del Inglés as we tracked the route of the motorway through desert scrub. Our last few Kilometres followed the beach promenade, with our dusty mountain bikes looking incongruous as we skipped past the sun worshippers. I found my all too brief outing with Free Motion very enjoyable and exhilarating. The whole operation ran with the precision of a Swiss watch and the guiding was very detailed, briefing you on each leg of the route, before agreeing the next rendezvous point. This practice gave the fastest riders the chance to let rip whilst the guide was often zipping from the front to the rear of the pack and watching out for those with mechanical issues, punctures or just plain old stragglers like me. It's such a shame that on such trips UK riders are so under represented compared to the army of Scandinavians who appreciate that Gran Canaria as so much more to offer than just; sun, beer, chips, "Kiss me quick" hats and camel rides. For the last couple of years I have made a trip to one of the German indoor ski centres during the summer season. I love being a contrarian, whilst the normal people are heading for a day trip to the beach I am heading down the coast road armed for a trip to the fridge. My mission this time was to rendezvous with fellow skibiker Timo at SnowWorld at Landgraaf in Holland. The bad news was that before I had even as got to Dover, the signs alongside the motorway were ominously announcing that Calais was closed and to expect long delays. My luck improved with the news that the ferry company were diverting their vessels to Dunkirk; a slightly longer crossing, but slightly closer to my destination. Having made it into France there were tailbacks on the roads which turned my anticipated 3 hour drive into a tedious 5 hour marathon to get to my overnight stop just outside Neuss, Germany. Before my rendezvous with Timo I enjoyed a warm up session at the SkiHalle in Neuss, which is part of the Allrounder Mountain Resort. Although it had only been a couple of months since the end of the last SkiBike Blog tour, all the sedentary office work I have been doing recently has clearly done a good job of turning muscle into flab. How so many facilities manage to make it through the thin summer months is a total mystery, it was so quiet at certain points that I had almost the entire facility to myself. It was the perfect moment to launch off the special race ramp at the top and put in some full speed runs down to the bottom. I packed up in the late afternoon and made the quick drive to Landgraaf, just over the border in Holland. I had opted to stay on site, not at the main hotel, but at the Overstof instead, a renovated farmhouse nestled in a nature reserve. I met up with Timo and we grabbed a quick bite to eat before making a twilight pilgrimage to the top of the "mountain" and made our peace with the mountain. Spiritually refreshed we then fortified our corporeal needs by knocking back some excellent Bavarian lagers he had stashed in the boot of his car. Landgraaf - we made our peace with the "mountain"
SnowWorld in Landgraaf lays claim to be the largest indoor slope in the World, I knew of it as a popular destination for UK snowboarders. Until recently I had been under the mistaken belief that skibikes were banned at SnowWorld, that was until Franky, a local skibiker corrected me. When it comes to indoor slopes, even the largest, spending a whole day inside such a small space can get boring really quickly. So once warmed up we decided to try working on the techniques that we felt needed improving. Riding backwards was one the neither of us could claim to have in our bag of tricks so we set up doing doughnuts on the snow. It is a lot trickier than I thought, but we sought of got it right a couple of times, the next challenge will be to get it right every time. After a light lunch we took turns to choosing which style of riding to make on the way down; sitting, standing, fast carves, skidded turns, etc. We finished off the day with a photo session, before packing away our kit and heading for the barbecue included in the price of our ticket. Make each run in a different style - sitting, standing, carved, skidded, etc. Timo was unimpressed by the length of the runs at SnowWorld, but then where he lives there are glaciers two hours away that remain open almost the whole year round. For a flatlander like me, it is still the largest indoor centre I have, or am ever likely to experience; add on the snow park with some intimidating features and some tasty cuisine all makes for a winning combination in my book. With low season summer promotions, a day's ski pass and an evening barbecue can cost under €30, at current exchange rates that's £22, or about what you would pay for an hour in an equivalent UK centre. As it is only 3 hours from Calais with a clean run, I can see this becoming a regular off-season jaunt. SkiBike Tour 2014-15 - Conclusion, This Is The Life! Looking back on the 2014-15 skibike season, it is easy to forget that it got off to such a terrible start. Many resorts had a green rather than a white Christmas, even a premium resort like Morzine was forced to bus their guests up to neighbouring Avoriaz where just a few runs were open and lift tickets were rationed. At Morillon, they opened the bare and rocky pistes to anyone that fancied a bit of out of season lift assisted mountain biking on Christmas Day. Despite a big dump of snow on New Year's eve, the snow drought continued through January and the prospect of the season becoming a total write-off looked ever more plausible. At the very end of January nature re-established the equilibrium and there were huge snowfalls that continued throughout February. I studied the forecasts and watched the webcams like a hawk; once I had completed all of my work commitments, I blocked booked my diary, packed the car and headed South to Geneva; better late than never! I had not been at all well during the winter months and wanted to start the tour with a gentle warm up day in the Jura mountains; blog tour stalwart Thierry drove over from the Aravis area to join me for a whirlwind tour of skibike friendly Col de la Faucille and Lelex / Le Crozet ski stations. Without any pause for recovery we then had our first group ride of the season at La Clusaz, most of which I spent falling about in the snow and going head over heals in the low visibility. I then had a couple of days in Sainte Foy, one of which was spent mostly in the company of Max, a skilled BMX rider, working there as a seasonaire. The look on his face when he saw me trudging towards him with not one, but two skibikes in tow, was priceless. 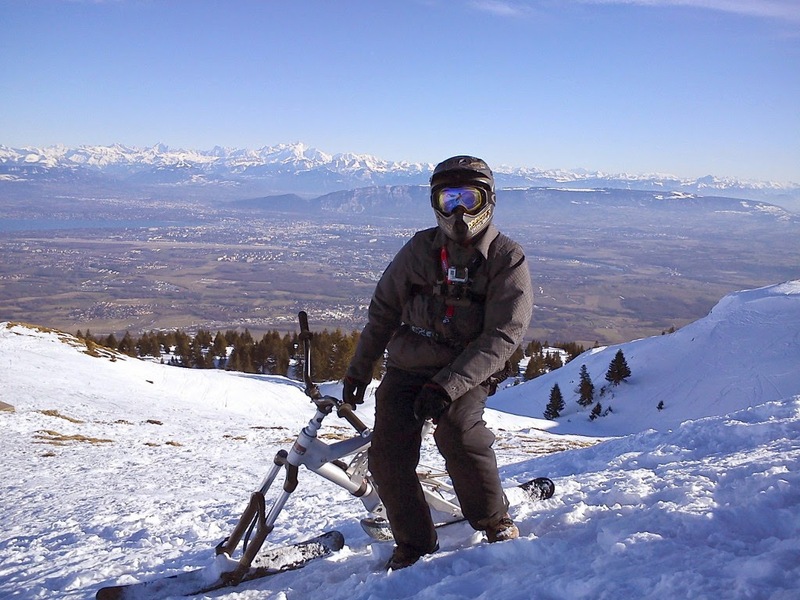 His previous skibike experience had been riding his ghetto BMX skibike conversion on his local golf course in South Wales, so riding my skibike on the big mountain was quite a challenge, but one he soon warmed to. Sainte Foy has historic connections with skibikes, but this was still the first time the lift operators had seen a freestyle skibike. They weren't sure it was wise to take one all the way to the very top of the mountain, but I soon proved the viability of skibikes as all mountain machines and made Sainte Foy the first new skibike friendly station of the season. Buoyed up by my recent successes, I made a day trip to Tignes to check out whether it was once again skibike friendly. It turned out that you can legally ride skibikes, and can use the gondolas and cable cars for access. The down side is that you can only use the chairlifts with foot skis, which was frustrating, there's no way I will be regressing back to this method of riding and you can guess where all the really good riding was to be found. I ended up switching to skis, it would be great if Tignes caught up with the trend for easy skibike access everywhere, making it only half skibike friendly for the moment. Whilst in the area I made an expedition to La Plagne to prove its viability as a skibike friendly resort. It has been used by skibobs for many years, but the trip verified that you can also use a freestyle skibike with impunity. La Plagne was the second new skibike friendly resort of the season and fortunately wouldn't be the last either, can you sense a trend emerging? 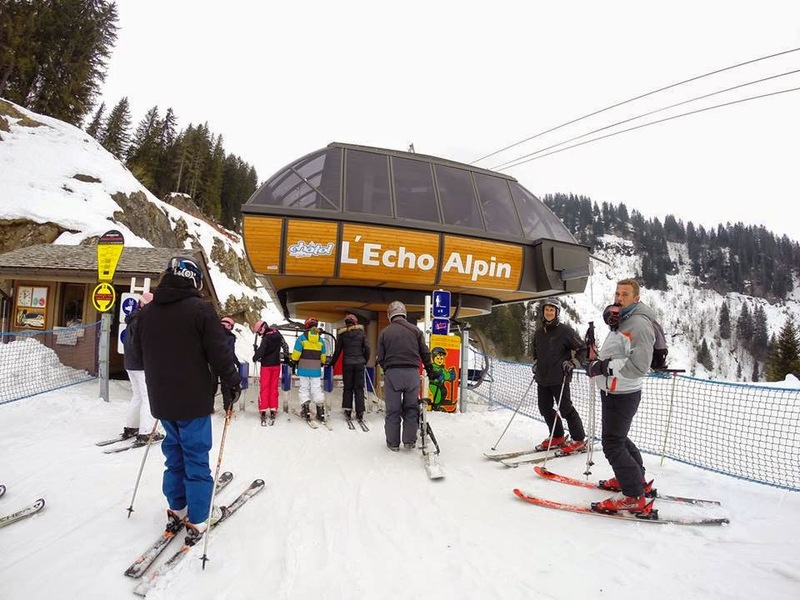 The venue for the next group ride was Avoriaz, it gave us a chance to scope out the adjacent runs at Châtel and Champery, although we didn't fully appreciate it they were two places we would be seeing more of in the coming weeks. Some very stormy weather followed, but once the clouds had lifted I managed a laid back afternoon at Le Crozet, cruising around and loving the skibiking experience. Feeling ready for fresh adventure I headed off the grid for an expedition to the small, isolated village of Areches Beaufort a charming little resort, which in many ways serves as a glimpse into a less commercial past. There's no modern glitz, no giant screens shouting advertising at you wherever you look, a pleasant relief from the marketing overload that so many bigger resorts can exhibit. The conditions weren't brilliant, but it was the third station with a positive attitude to skibiking I had found this season and will be worthy of a return visit next year. I had a fun re-union taking giant steps walking on the moon with Kevin the deaf skibiker at Val Thorens. He didn't say a word to me for the whole day, but he laughed like a drain, especially if it involved me making slow motion falls or a really good face plant. Mmmm snow sandwich anyone? Thierry and I then broke fresh ground with a trip to Les Arcs fixed in our cross-hairs. Les Arcs is also the self proclaimed "home of (French) snowboarding", this was the place where the snowboard broke out of the snow park and became accepted as an all mountain machine. To say that there are parallels with the history of modern freestyle skibiking would be an understatement. Once again it was totally skibike friendly, making it the fourth skibike friendly resort of the season. Thierry, Stephane and I then made a visit to the Maurienne valley to enjoy the novelty of being able to skibike at Valloire, the fifth new skibike friendly resort of the season. Valloire has charm and a distinct Gallic/Italianate cross-over vibe, the lift infrastructure at was very good for a smaller resort and the attitude commendable. 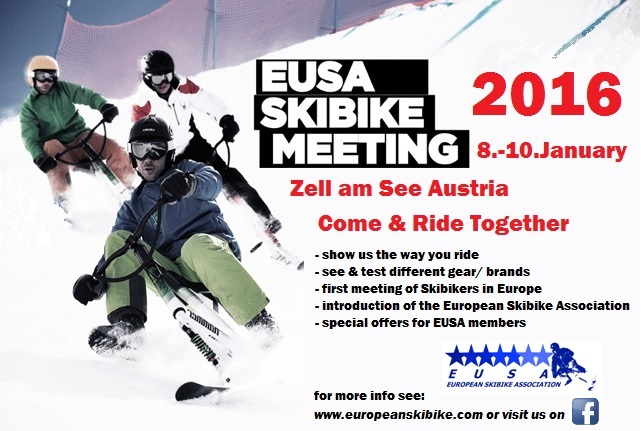 With easier access from Italy than France, it would make a great spot for a novice Italian skibiker from Milan or Turin to get in some riding experience. I took a day off from skibiking and went house hunting in Morillon for a potential base camp for future tours and just maybe a place to retire to later in life. House hunting in Morillon - a potential base camp for future tours? 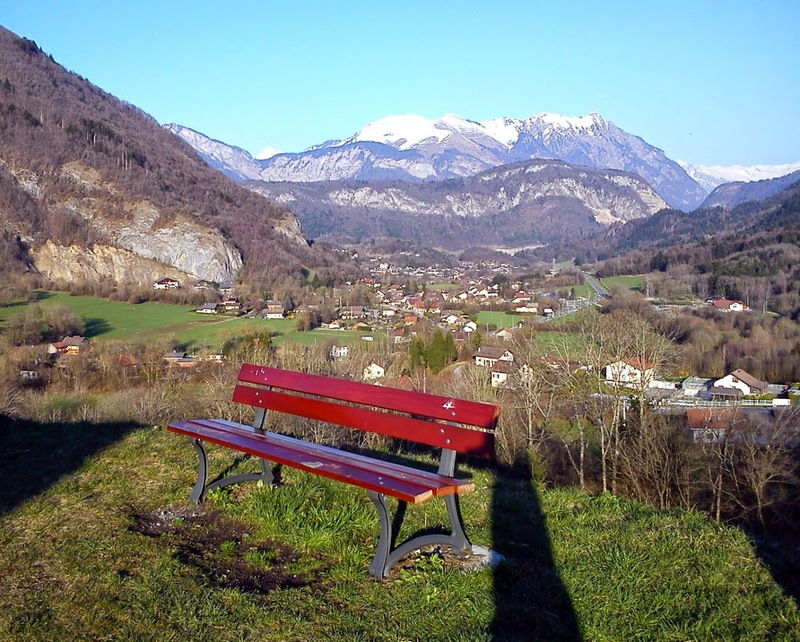 I ended the first tranche of the tour by getting thoroughly chilled out on the Dole, drinking Myrtle beer in the car park and musing on the joys of having a great big snowy hill and a chair lift just 30 minutes from my Geneva base camp. Chilled out drinking Myrtle beer! Back in November I had spotted Jonathan's interest in skibing via Facebook, I couldn't resist the opportunity to introduce myself, in the vaguest hope that he would give skibiking a go, whilst in the company of some unknown and eccentric Rosbif in Combloux. Amazingly he went for it and even came back for a second bite later on in the tour. On the my last run I unwisely "went for it" on the Boarder Cross circuit, promptly overshot the banking and went sailing into the hillside at full tilt. Fortunately my head broke the fall! I took a weeks hiatus and headed back to London as "Walking Wounded" to earn myself the cash to spend on "Part Deux" of the tour. Back in the skibike saddle after a week off, I enjoyed my second ride with Jonathan at the ski station of Praz de Lys / Sommand he was rapidly turning into an off-piste monster! I then had an early start to join Thierry on a visit to Champery which was was a little different from the average tour day. Our objectives were; to meet with the operators of the lift company, do some test rides and show how skibikes can safely use the various types of chairlifts. All in the hope that by next season we will have another resort in the Portes du Soleil to ride. We had passed the ski lifts of Châtel en route for our morning ride at Champery, so it would have been nothing short of churlish not to have stopped on the way back for an afternoon ride. Châtel has been SnowScoot friendly for a long time, more recently it has opened up to skibikes too, for both of us this would be our first opportunity to see how the theory would translate into practice. 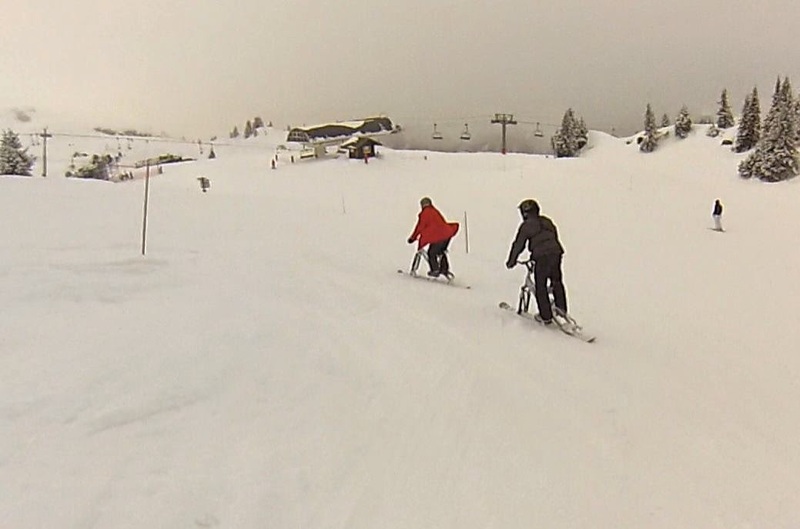 The trip was a resounding success and Châtel became the sixth new skibike friendly resort of the season. 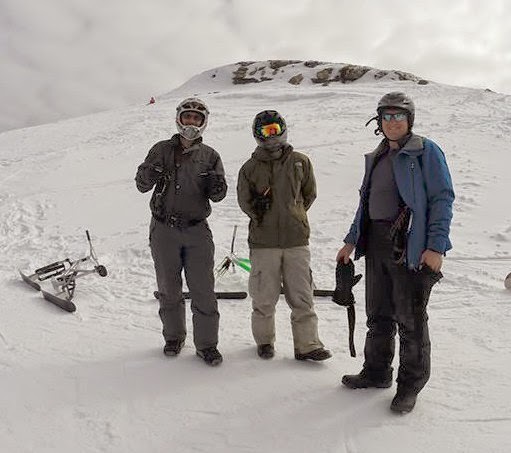 A second trip to Avoriaz which was somewhat of a reunion, blog co-writer Wayne had come out for a long weekend to join me and was joined by Thierry and John who had come all the way from the 3 Valleys. Group rides always have a different feel to solo expeditions, sometimes you are spurred on to get out of your comfort zone and try new things, like that black run that looked too steep for freestyle skibikes. Continuing the theme of testing the skibike friendliness of sundry ski stations, my focus of interest shifted to the Les Sept Laux in the Chaîne de Belledonne, somewhat off the beaten track, although not really that remote. John travelled over from Les Menuires to join me and it turned out to be quite a large station, with plenty of variety, very quiet and peaceful and lots of good runs. It was another success and the seventh new skibike friendly station of the season. Success at Les Sept Laux spurred me on to check out Chamrousse, another Chaîne de Belledonne ski station. Skibikes aren't officially permitted at this ski station, but they were happy to let me ride providing I had a safety leash. The weather was appalling, but my priority was to ride the eighth new skibike friendly station, tick the box and move on to the 3 Valleys. This year was the first time someone has made me an offer I couldn't refuse and no the Mafia weren't involved, it was the chance to hang out in the company of fellow skibiker John in Les Menuires to do some easy riding all around the 3 Valleys domain. I would like to report that it was all plain sailing, but sadly that was not so and I have been left with the lasting impression that it was somewhat of a bitter-sweet experience. It was such a slow season to get started, but with fresh snowfall and a shift to much colder temperatures it seemed reluctant to end. The timing couldn't have been better for an Easter Monday jaunt to Valmorel in the company of John and Thierry which turned out to be the best riding of the season. A message from Tim and Lesley to say that they were going to make an end of season trip to Morzine, provided a great reason to delay my departure and get in a final group ride of the season in Avoriaz. Due to slow post operative recovery Tim couldn't ride and Leslie wouldn't even consider it, instead I had to hang out with the skiers. So where could I find for the final ride of the tour? I pondered long and hard about where to go, I would have been happy with any of my local little Jura ski stations, but despite bountiful snow, they have all stayed firmly on schedule and already closed for the season. So instead I opted for the Grand Massif domain, which has in so many ways become a home from home. So where could I find for the final ride of the tour? I have always found a piece of music that sums up the vibe of a season's tour; this little ditty may not be the most current, but I heard it a couple times on French radio and the words seemed oddly appropriate to me after having I spent so much of this tour hunkering down in a guest or hotel room bed.